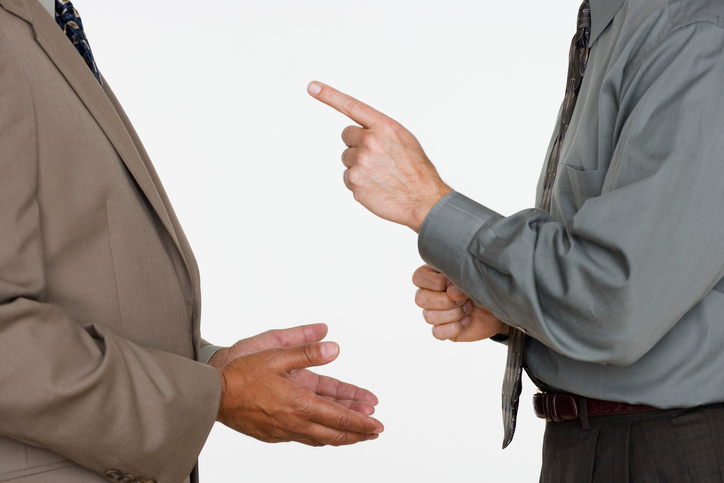 Investors, consumers, regulatory bodies, and the media are putting heavy pressure on boards of directors. They are being held accountable for a whole range of strategic missteps, risk management errors, and security flaws. One survey of board members in 2016 found that directors see a disconnect between these high expectations and what they can realistically accomplish in their positions. One of the possible reasons boards see limitations on what they can accomplish is that they aren’t getting all the information and insights they need to do their jobs. And where does that information need to come from? The chief financial officer. 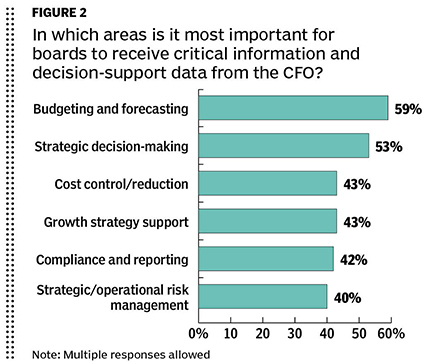 A new survey from CFO Research, in collaboration with treasury management software provider Kyriba, found that CFOs aren’t always delivering the information and decision-support that boards want as they seek to manage burgeoning corporate risks. The survey identified key areas where CFOs need to communicate more effectively, and act more decisively, to help boards protect shareholder value. After decades of investing in finance, treasury, and risk management systems, why are some CFOs still not able to meet their boards’ expectations for information and insights? The most commonly cited factor by the 167 U.S. senior finance executives surveyed was a suboptimal organizational structure in which different corporate functions and business units are walled off from each other, operating in their own silos. That hindrance was cited by one in every two survey respondents (50%). Other major contributors included a corporate culture that does not promote or facilitate a better relationship between the CFO and the board (41%), a lack of time on the CFO’s part (30%), communications issues (29%), and, finally, the composition of the board itself, cited by 27% of respondents. To their credit, CFOs seemed to have gotten the message that they need to do better in fulfilling the support needs of the board. It’s not out of altruism: CFOs jeopardize their own ability to influence the enterprise when they fail to deliver the insights and advice that corporate board members need to make decisions. A whopping 94% of the survey respondents said their CFO is seeking better ways, and better technologies, to meet demands from the boardroom and the CEO. 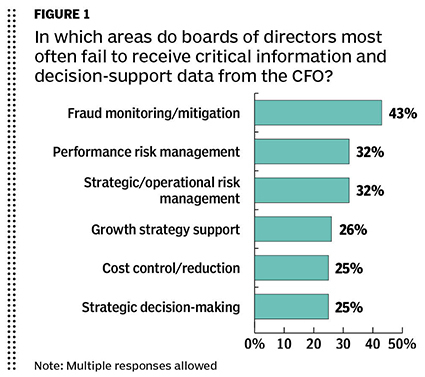 On the technology front, finance executives said, the specific areas where CFOs need better tools to help boards make better decisions were fraud risk (cited by 34% of respondents), compliance risk (30%), performance risk (30%), and regulatory risk (29%). Fraud risk is high on boardroom agendas in large part because it remains a stubborn and growing problem. Many companies have embraced a broad range of fraud-fighting tools and strategies, including user authentication processes, use of electronic payments rather than vulnerable paper checks, and daily reconciliations. However, the incidence of fraud shows no signs of diminishing. Indeed, the survey found that 4 in 10 (40%) finance executives said their industries were experiencing higher rates of payments fraud than they did two years ago. Only 16% of survey respondents strongly agreed that the finance teams in their industry had strong-enough processes and technologies in place to capably and efficiently detect fraud. Given that a big part of corporate treasury’s role is safeguarding corporate cash, it’s not surprising that this focus on payments fraud interests the board. The treasury functions most important to boards, the survey found, were cash and liquidity management and forecasting (cited by 66%); risk management, as it related to all risks (46%); and financial transactions, including debt, investment, and foreign exchange (46%). 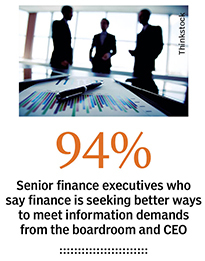 Most directors today expect to have a close, direct working relationship with the CFO. The good news from the survey was that a strong majority of survey respondents (94%) said their CFO was perceived by their board as a critical, strategic business partner. Asked to identify in which areas CFOs can deliver the most value for the board and the CEO, the finance chiefs responding to the survey chose managing business planning and continuity (cited by 52%), managing financial risk to prevent loss (51%), reducing costs and improving margins (43%), helping unlock working capital to spur growth (37%), and ensuring regulatory compliance (30%). The finance executives polled by CFO Research said that, apart from acquiring better technology, CFOs can take additional measures to make that technology, and the insights it can help provide, more useful to corporate directors and CEOs. Notwithstanding these comments, CFOs should continue to look for ways to improve how they present data to their CEOs and the boards. There’s a big difference between “cleaning up” data so that the bad news is hidden and presenting data in a clear, easy-to-follow, and, ideally, interactive format. 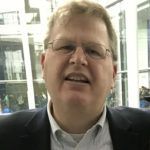 That’s becoming all the more important now that big data and advanced data analytics create the potential for decision-makers to be inundated with information. Fortunately, new data visualization and business intelligence tools can be invaluable for CFOs looking to provide guidance.